When I was writing Wasted, I took a 30-inch by 40-inch piece of white foam board and rubber cemented on it photographs from the case. I took another 30-inch by 40-inch piece of foam board and Scotch taped to it a 23-inch by 30-inch copy of State’s Exhibit 38 – a scaled diagram of the crime scene. 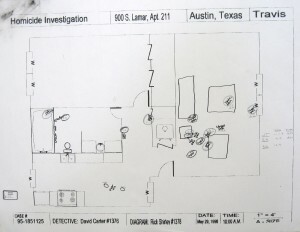 That diagram was pockmarked with circles showing exactly where blood splatter was found at the scene, which was the victim’s apartment, and whose DNA was in the splatter – the victim’s or the killer’s. Let me back up and explain that Wasted was about “A rich lesbian. Her beautiful young girlfriend. 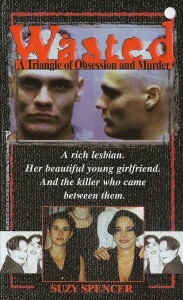 And the killer who came between them.” At least that’s the description placed on the original edition’s cover. And despite it being a rather sensationalistic description, it is pretty darned accurate. Regina Hartwell was the rich lesbian who was murdered. Kim LeBlanc was her beautiful young girlfriend. And Justin Thomas was the killer who came between them. 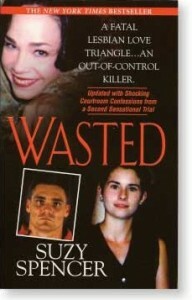 The original cover of WASTED. But back to the poster boards. I placed them next to my computer so that I could stare at them every day that I was writing. Every day I was reminded that Regina’s DQ-Alpha DNA number was 2,3, Kim’s was 1.1, 4, and Justin’s was 1.1, 1.3. Every day I looked at the blood splatter in Regina’s living room, hallway, and bathroom. Each and every day – and often in the middle of the night – I studied the photographs of the blood-stained carpet in her living room, the cigarette butts and remote controls on her coffee table, the colognes and perfume on her bathroom counter, the shed where her dead body lay in her Jeep until she and her vehicle could be burned, and her charred license plates on the ground – RHV … and then … the rest of the numbers … they’re hard to read in the burned blackness … 33H, I believe. 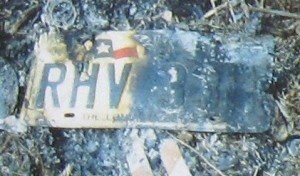 The license plate to Regina’s burned Jeep. I stared at her smiling face in high school. She appeared so happy and innocent. Appeared. In those photos, she used to remind me of a young Reba McIntire. For some reason, she doesn’t any more. Daily, nightly, my gaze moved to the pictures of Regina as a young adult. In some, she grins goofily for the camera. In others, her back is turned. In one, she looks forlornly at her feet as she smokes a cigarette. In another, she stares out her Plaza Hotel window in New York City. I always think of her as being lonely in that picture. Maybe that’s because Kim left her on that trip, and right above that picture, I glued a photo of Regina and Kim kissing in their New York limousine. I have photos of Kim as a smiling tot, a happy cheerleader, a proud graduate, a grinning teen playing on a jet ski, and a contented young girl as her best boy friend colors her hair. Then there’s the picture of Kim the day she was picked up for Regina’s murder. Her face is gaunt. Her eyes are blank. She’s a dying drug addict. I used to display this poster board of pictures when I’d go into high schools on the pretense of talking about writing. I was really talking about drug, alcohol, sexual, physical and emotional abuse. Literally, students would crawl on their hands and knees to get closer to the poster board and stare at the pictures. They couldn’t believe that the beautiful young cheerleader was the same person as the dark-haired, sad-eyed, emaciated addict Kim LeBlanc. Equally, they couldn’t believe that the handsome, preppy-looking, young man walking into the courtroom was the same Justin Thomas pictured in his mugshot – hollow-eyed, dark-eyed, angry, threatening, terrifying, and with a bad Mohawk haircut. I’m digressing from my point as I now stare at those poster boards and get carried away with my memories. My point, as I write this on Halloween Eve, is the ghost of Regina Hartwell. Because of Regina, I couldn’t let this book go. Regina wanted to be famous. And I felt like that as long as I pushed and promoted this book I was helping her reach her goal, even if it was after death. But, I had a shrink who kept telling me that I had to let the book go, that I had to put it away, and that I had to move on to the next project. So, a year or more (and it was probably more) after its publication, I packed up all of my Regina Hartwell files, all of my Regina Hartwell court documents and transcripts (and I used to go to sleep surrounded by those transcripts), all of my interview notes and tapes, and all of my poster boards, and stuck them in the back of my guest room closet, facing the back wall. That night, after I went to bed, the temperture in my house suddenly rose. I heard the heater running. I couldn’t figure out why. It wasn’t cold outside, nor in my house. I got up to check the thermostat, which was right by the guest room door. When I did, I noticed that the faucet in my guest bathroom sink was on. Again, I couldn’t understand why. After all, I was home by myself and I rarely used that bathroom. I turned off the water. I then walked the few steps from the bathroom to the thermostat and I tried to turn off the heat. It wouldn’t turn off. Is this Regina’s ghost? Is she doing this? I tried to laugh at my thoughts. Immediately, though, I walked into the guest room, threw open the closet doors, pulled out Regina’s posters, leaned them against the bed, and right as I did, the heat finally turned off, all on its own. I figured Regina Hartwell just wasn’t ready to be put in the closet. Oh, my gosh! Do you see it? I was going to tell you that when I first tried to store my Regina files that I tried to remove the photos from the poster board, but most of them refused to come off. A few did, though, so there are some photos missing. But, now, do you see it? 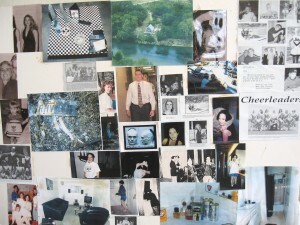 Look at the black and white photo, top row, to the right of the color photograph. It’s supposed to be a picture of Kim LeBlanc. But there’s something on top of Kim. I promise, I didn’t do anything hinky to this photo. Here’s a close-up of it. Is that a ghost? Really, I didn’t do anything to the picture. Wasted ..... I could not put the book down. Though almost through out the book and afterwards made me real sad for Regina. So much so that I came online and typed her name in and found your blog. I so believe in the paranormal yet I am not someone who believes everything is from the other side. I will and continue to pray for Regina. Heyyy, i saw you in the Investigation Discovery! (sorry, you should hear this every day). The white spots in the photo were caused by the flash of your camera, or really were on photo paper? I do not know if I understand corretly the image, but it seems a skull, or a mouth below the Kim´s neck, i dont know. I really want to buy his book "Wasted" in Amazon, just need to know how to use an international credit card. ^^ Bye. (Sorry for my bad english too, i'm using a translator). Thank you, Leta. In what country are you? I am most grateful that you want to purchase Wasted. Actually, I think the "ghost" in the photo was caused by the rubber cement that I used to paste the photo onto a poster board. Suzy, It's me again, Sandy. I think of Regina often and a couple of times a year (when it first happened it was very frequent) I look up stuff anything and everything I can. I am not sure why. I guess we all have the ability to feel like if we had made more time for someone, if we had been there for guidance, if she just would have done A or B instead of C. But always my thoughts go back to camp when we used to stay up late talking and laughing. She was a bit fascinated with death. Which I always attributed to the loss of her mom and then grandmother. But in those talks she often mentioned that she would die young and she would come back and see people. She would talk to some. Haunt some. She idolized marilyn Monroe. And Duran Duran. Just thought the picture was funny after all her talk lol. I thought, "well, girl, that's just like you!"